After the streak of films presented here, you think I would finally come across a gem among the bunch. Well, today is your lucky day because I get to go over what makes The Cabin in the Woods such a delight. Writer Joss Whedon has a very interesting style that feels like a near parody while playing it as a straight forward narrative. At times, his material can get self-aware but not to the point it becomes painfully obvious. Cabin was also directed by Drew Goddard who worked previously with Whedon on the Buffy the Vampire Slayer TV series and its spin-off Angel. You think these two talents would make a match made in horror. And surprisingly, that’s what this movie is. A great send off to all the traditional horror tropes and cliches we come to expect from scary movies. The plot follows a group of teenagers who drive off to the middle of nowhere in the forest just to booze up, drug up and party. Its the typical kind of schlock you would find in The Evil Dead. And within the group are people that feel like basic stock characters like the virgin (Kristen Connolly), the sultry one (Anna Hutchinson), the jock (a surprisingly young Chris Helmsworth), the drug addict (Fran Kranz) and the smart one (Jesse Williams). As one would expect, it becomes the ultimate guessing game to who is going to die and who is going to live. And sadly, I wish I could talk about what makes this movie work but there’s a reason why. Surprisingly, a lot of fans tend to be very hush-hush about the “secrets” and twists that happen. And honestly, I agree. Why spoil something good in a movie when someone is going to see it? I remember learning that one the hard way when I ruined the ending to Borat to a friend of mine. He never forgave me or even talked to me after that. It was that kind of moment. A movie tends to play with your expectations and when it goes down a path your uncertain of, that is when it gets interesting. What starts as a basic teen horror becomes more of an a homage to the genre along with a send off to the viewers that respect it. If we know the cliches so well, why now twist them around? Why not have the druggie suddenly get smart or the jock be less of an arse and try to be nobel? That’s just scraping the surface and dare do I ruin the monster(s) that lurk about the place. Trust me when I say less said the better, because this one is worth checking out. While its not a masterpiece by any means, there is one huge element that makes Cabin stand out. A twist so good that you have to find out for yourself. OR IF YOU ARE DYING TO KNOW, READ PAST THIS POINT. 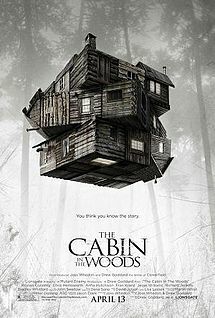 ALL ELSE WHO WISH TO LET THE MYSTERY OF THE CABIN BE SOLVED UNTO THEM, DO NOT GO ANY FURTHER AND PLEASE WATCH THE MOVIE! If you read past this point and what to know what happens…then your in for such a treat. Its revealed that cabin is part of a scientific experiment to please a set of strange gods that rest underneath them. As each of the stock characters die, it fills to be a sacrifice to keep the gods pleased and not bring on the end of the world. This here is what makes Cabin stand out. In fact, every scene with the scientists are the best part. As they control the environment above ground, we see how things can be motivated with the push of a button and what can be used to meet their demise. SPOILER ALERT! Monsters gone amuck! But it gets better. Further in, we see that they have a huge collection of monsters they use to unleash to the places they created. It almost feels like a complete ode to nearly every horror movie out there with creepy clowns, werewolves, giant snakes and much more that inhabit these odd cells. But even describing this is still scraping the surface. I dare not ruin anymore or else the whole game is given away. But I will say the magnitude of monsters gives for a great opportunity in the climax when hell breaks loose as we are giving the ultimate monster mash ever depicted on film. Its an entertaining sight that will make any creature fan pleased. Posted on October 17, 2015, in Horror-Wood 2015 and tagged Anna Hutchinson, Chris Helmsworth, Comedy, Drew Goddard, homage, Horror, Horror-Wood, Horror-Wood Blog-a-Thon, Jesse Williams, Joss Whedon, Kristen Connlly, stock characters, The cabin in the woods. Bookmark the permalink. Leave a comment.